I've been tinkering for the last year or so with a “photostream” addition to my blog, in which I can highlight the occasional not-too-bad photo I post on my blog. I'm not sure it's really ready, but I'm releasing it now and we'll see how it goes. I've partitioned up the best images from my blog into several photostreams, including one for Japan, and one for each season: Spring · Summer · Autumn · Winter. There's also a catch-all Miscellaneous stream for odd, kooky, or otherwise interesting (but not necessarily “pretty”) photos, and a stream full of pictures of my kid that I suspect only I and my mom will use. Finally, there's an overall “Main” stream that includes all the non-kid photos. Visiting a stream's page, you see a gird three pictures wide. It may take a while to load, but I make sure to load images from the top down, the screen should fill up fairly quickly. You can scroll down, or hit the [reshuffle] button to see different pictures. The control panel is normally intended to be hidden. Mouse down to the lower half of the screen, and it'll disappear. To visit the next picture in the stream, use the N key. To go back to the previous picture, use the P key. To visit the blog post associated with the picture, hit ENTER. To return to the grid of photos, use the ESC key. Bringing the mouse to the upper half of the screen recalls the control panel, which you can use to start a slideshow, vote on a photo that you think is better/worse than average for the stream, etc. Returning to the grid (via the ESC key, or the grid icon in the control panel), and in the upper-right you'll find links to the other photostreams, and to the Media RSS feed for the stream. I spent considerable effort in building it to make it efficient (it pre-downloads the next few images while you're looking at one, for example), but there's a lot of image data involved, so the first time you try it, it'll likely be fairly sluggish for the first few pictures. As I said, I've been tinkering with this on and off for the better part of a year. 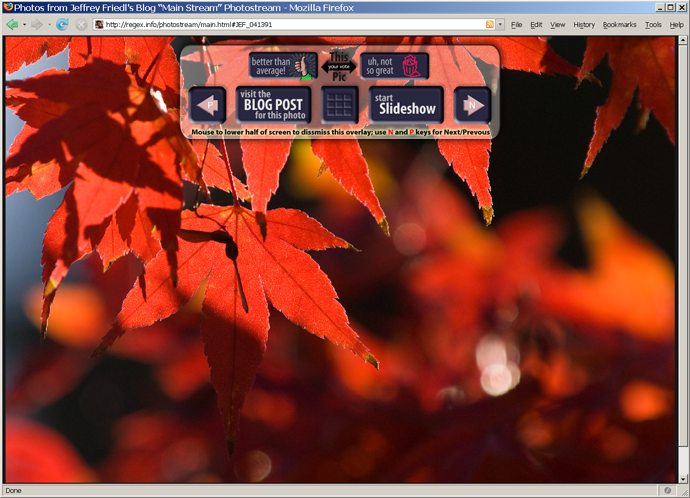 I got the idea when I saw the FoxSaver add-on for Firefox (the name coming from Firefox + Screen Saver) that could turn any Media-RSS feed into a pretty screensaver-like slideshow. You can view my streams with it, but better yet, you can view its streams of really amazing photos. I finally got serious with it in May when I built the “control panel” thing. It would be an understatement to say that graphical design is not my strong point, but I was really happy with how it came out. I had a friend whose opinion I respect take a look at my photostream stuff at that point, and his response was essentially “it's great, except for the really ugly control panel.”. Doh! Since then, I've spent the last couple of months deep in though on how to fix things, but I've come up with nothing, so yesterday I slapped the “... to dismiss this overlay” note onto the panel in the hope that greater education is the key, and we'll see how it goes. I’ll be sending the link along to a few people. This really is a compelling collection. Will be revisiting and trying the others, too. Thanks. You misspelled “Previous” in the toolbar. I think this is wonderful. I’d love to try something like this with my personal blog. Is it for sale? Your photography is beautiful. I really enjoyed looking at your pictures. Just saw this post after my previous comment; I guess you took the dynamic gallery to a whole other level. Serious props! Have you ever considered making your creations available for sale? I’m positive there are other photographers that would be willing to buy, just look at the previous comment. 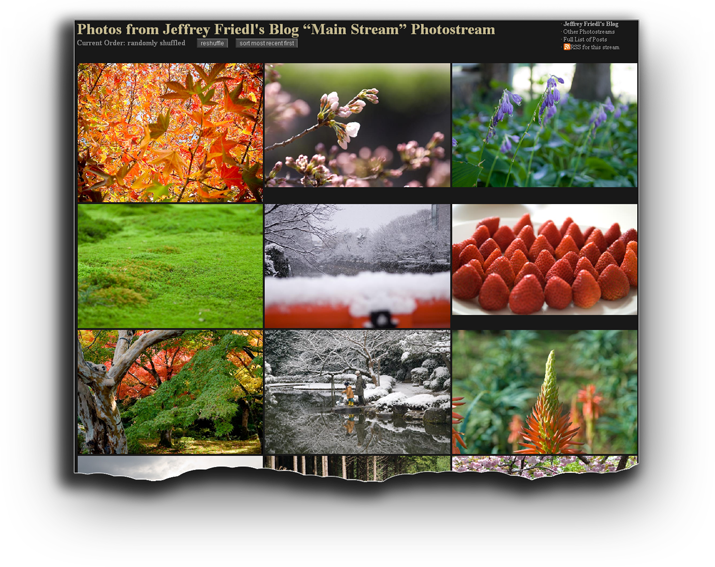 Dear Jeffrey, I’ve been enjoying this marvellous photostream on and off for a while now. But this evening, I really let it run and run and tried to take in each photo as its proxy for the real world you recorded: you recently mourned the fact that so much has been destroyed in the terrible tsunami devastation. So much that you never got a chance to record. I’m touched by that thought. So perhaps, after a respectful time as passed (no disaster tourism of course), you might be able record some of the rebuilding? Keep the photos coming. nice pics… wanting to show off new android tablet. however the toolbar does not lend itself to browsing manually because of the letters. suggest right side of photo for forward, left side click for previous. I am fully blown away by your photos. For the first time I ignored the movie I was watching and every time I would think OK i should stop with this photo now. It is a never ending journey on your photostream with never ending thoughts of how he may shot shot this, what technique he may have used or what lens. I must say these are the best photographs I have ever seen in my life at a single place (not an exaggeration). Quite an inspirational stuff, I will keep visiting this photostream to get some gallons of inspiration and probably reduce time in watching every podcast that I come across (Unfortunately I cant download all your photos and keep it in my travel device as I could do with podcasts). Thanks a lot. Breathtakingly beautiful photos! One could die happy in a place like this (Japan) because it looks like one is already in Heaven. Thank you for sharing such incredible beauty. These photos are stunning. Thank you for sharing them online. I wonder what is your policy regarding sharing them on the internet, especially Facebook? Is it sufficient to credit you and link to this blog? I have a Facebook page where I share poetry and quotes with pictures of gardens and landscapes, no commercial use, just for fun. Came here via your plugin for LR. and got stuck ! I think that the most valuable is your comment/story for each picture. That make them much more than “only” wonderful. Thanks for your explanations about everything, i did learn a lot ! Hi Jeffrey. Love your website, although I’ve only spent 10 minutes on it. I found your pictures through a “meditation room” image search on Google and found your Enkoji and Rurikoin Autumn shots. Simply beautiful. I haven’t found your story on your blog yet, but I will continue to look for it after I post this comment. Your photos are gorgeous and now it confirms my desire to travel to Japan, and now specifically Kyoto. Is there any book, article, anything that you could recommend to help a traveller [not tourist 😉 ] come up with a plan to do a 7-14 day Japan tour? I’m originally from New Orleans and have developed an email I send to friends going there . . . but a whole country is a different matter. I now live in Austin, TX. Thank you so much for your photos. I hope to peruse more in the future . . . Thanks for these posts and incredible photos. My wife are I are staying in Kyoto for a couple months in a house in the area wedged between Kyoto University and Yoshidayama Green Space, so have been visited some of the temples and shrines you have photographed so beautifully. We plan to take a short trip up to Obama next weekend and maybe do some casual bicycling, which is how I came across your blog.